Family and friends of Kristina and Angelina admire the YMCA's Bear Fever bear. 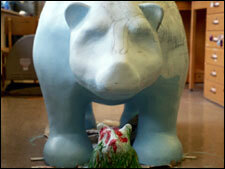 Bear Fever's “Mommy” bear will watch over all the children who visit the YMCA's “Growing Dreams” center. Teacher and artist Beth Wagner and student artist Amanda Drewicz share the journal they created about “Mommy and Me” during the artistic process with associate editor Diane Van Dyke. The dedication focused on the positive and encouraged smiling faces. Amidst the crowd, associate editor Diane Van Dyke conducts her interview of teacher and artist Beth Wagner and her protégé Amanda Drewicz. Show the love” was the order of the day. “Celebrate life and one another” was the theme of the dedication which included hugs all around. Diane Van Dyke captures the dedication moment in a photograph. Dedication of the YMCA bear attracted a crowd of family and friends of Kristina and Angelina on April 30, 2006. 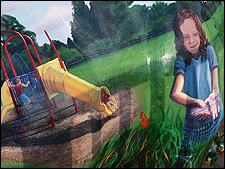 Images of the playground highlight the YMCA bear which was done under the direction of BASH art instructor Beth Wagner with the help of BASH students. BASH art instructor Beth Wagner captures the love between mother and daughter critical to the memorial this bear represents. Artist Beth Wagner, art instructor for Boyertown High School, poses with the YMCA Bear Fever bear, a stunning painting of images commemorative of the YMCA’s Growing Dream center and a memorial to a mother and daughter who frequented the YMCA and were killed in a car accident. “Is it live or Memorex?” Artist Beth Wagner’s YMCA bear presents images so realistically rendered, you have to find the bear’s ear to bring remind you it’s a painting. 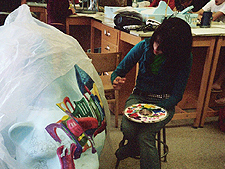 Student work on the YMCA bear, which was done under the direction of BASH art instructor Beth Wagner, helps underline the mother/daughter connection this bear memorializes. 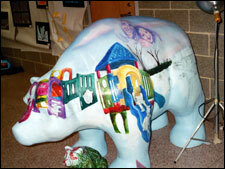 Images of the playground and of other YMCA services are featured on this bear. 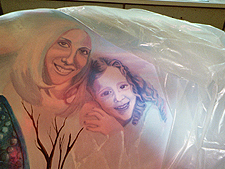 Two and a half years ago, a mother and her daughter died tragically in an auto accident. They left behind a family and community who deeply cared for them. So affected by their loss, these people stepped forward to honor Kristin, the mother, and the child, Angelina. Through donations of time and money, the pair would not be forgotten. A memorial fund was taken up at the local Gilbertsville YMCA, “Growing Dreams.” Kristin and Angelina had both been members at the YMCA and forged many friendships. Especially, three-year-old Angelina, in the daycare classes, brought smiles to many faces. After her death, her family wanted to use the donations to purchase benches and playground equipment at the YMCA. However, instead, in the spirit of the community project, Bear Fever, they decided to adopt a bear. It would be decorated to honor Kristin and Angelina, and it would sit outside the YMCA. In further memoriam of the two, a “baby” bear would be coupled with the larger “mama” bear. Tessi Melchior, an employee at the YMCA, was in charge of continuing the project. She had known the two people well and was passionate in helping the family. She recruited an artist, who like her, was affected by the accident, and the two sat down to create a lasting and special memory of Angelina and Kristin. 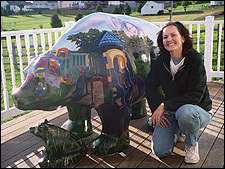 The artist is Boyertown Area Senior High School art teacher, Ms. Elizabeth Wagner. Her son had been in Angelina’s daycare class, so she was very willing and honored to create the memorial. 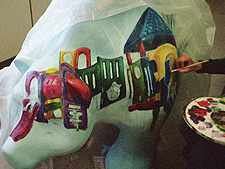 She started, with the help of art student Amanda Drewicz, in March 2005. Together, the two have planned, sketched, and painted. Along the way, they have recorded their progress with pictures. Through the summer until late October, they have toiled to prepare the bears. The family will also be very pleased when they see Ms. Wagner’s completed work. A mama bear stands, covered in pictures of the YMCA center. Children are running everywhere through the grass, laughing and smiling. A playground covers the front of the bear with the YMCA motto on a sign in the grass. Across the bear’s back, the portraits of Kristin and Angelina are sketched in the clouds, suspended above the children of the YMCA. 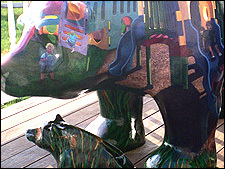 “ It’s absolutely beautiful!” Ms. Melchior said, whose favorite parts of the bear are the faces of Angelina and Kristin. Down mama bear’s legs, grass finishes the landscape. And appropriately, sitting under her protective mother, baby bear is also covered in grass. At this point, several personal touches were added. A sand dollar, important to the family, was painted in. Most interestingly, a myriad of dragonflies are hidden in the grass. After Kristin and Angelina’s death, the family read an inspiring book. Through a lovely story and pretty pictures, it gave the heartbroken family something to hold on to. It said that when someone dies, one would see dragonflies flying around. They are there to brighten one’s world. 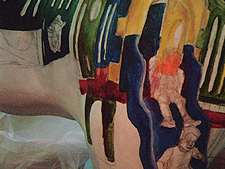 The beautiful image created from the story is captured in the bears. Children can search the grass to find the dragonflies, and their lives will be brightened too. A cousin to the family has even painted her own dragonfly. 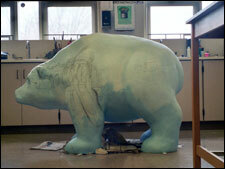 It will be added to the bears before the final coatings. As one can see, the bears will be an amazing memorial to Kristin and Angelina, and much of the credit for it goes to the YMCA contributors. Throughout the town’s history, the YMCA has continually helped to foster community. When asked how the YMCA “builds a better Boyertown,” Ms. Melchior answered very honestly. “ It is a place for everyone,” she said. “Everyone can call it home” because there is always something different to do.” Ms. Melchior feels the motto exemplifies it. The YMCA helps create “strong kids, strong families, and a strong community.” In tradition with YMCA excellence, they are holding a reception for the family. There, the bears, in all their beauty and uniqueness, will be revealed for the first time. Then, they will find a permanent home outside the Growing Dreams Community Center. From the horrific death of two loved ones, has come an incredible community masterpiece. Out of the rain has come a rainbow.